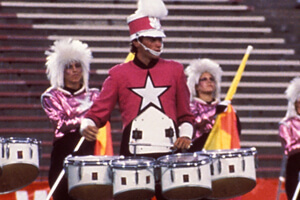 The year 1986 was Star of Indiana's second year of existence, and after placing 10th at the World Championship Finals in its inaugural year, the corps continued its methodical climb up the competitive ladder. Star's first show, "Walt Disney Salute," was a fairly light and breezy program with its demands well suited for a first-year corps. But the staff knew that to climb the ranks, the second-year show would have to contain a little more "meat." And so "Adventures on Earth," featuring the music of John Williams, was chosen to push the corps forward. And indeed it did so, propelling the corps into eighth place and breaking the 90-point barrier with a 90.50 in Finals. The title assigned to the show developed well after the conception of the program and was lifted from the title of the corps' opener, from the hit film "E.T." The title wasn't even known as such to most fans until quite some time later. Back in that era, shows were generally not titled. For example, Star's show the following season was simply referred to by most as "The Circus Show." "Adventures on Earth," (the opener) started with 10-second brash and brassy fanfare that instantly got everyone's attention, before progressing into the main body of the musical selection. But perhaps the first thing that vigorously caught the attention of all was the wigs worn by the color guard members. These silver-white assemblages of big hair mullets-run-amok were—in the initial design sketches—intended to make the guard look galactically glamorous. Instead, the wigs gave off the aura of Hell's Angels biker chicks having a bad hair day and being about five minutes away from climbing into the stands to start knocking heads together. It's the same style adopted by punk rocker Courtney Love in the early 1990s. The wigs certainly helped create a visual attitude and with a little Endust, could have also seen double duty to help keep the corps' housing site gym floors clean. 1986 Star of Indiana performance excerpt. Other moods from "E.T." followed, including a ballad and the jaunty percussion interlude, before ending with the "Main Theme." Music from "Close Encounters" was next, starting with a bowed vibraphone stating the famous five-note melodic theme. While the tension of cosmic chords built up in the horns, low brass players who weren't already in the contra section moved to the front sideline to pick up horns that were grounded on the field, raising the number of contras for "The Conversation" to 18. (This was still when the maximum number of marchers was 128, so having 18 contras on the field was not something we had seen before in DCI competition.) A lone soprano player communicated with the contras, who were duplicating the Mother Ship from the movie. The first low notes out of the contras shook the bones of the fans in the stands. (This was the moment in the movie when the windows broke in the control room atop Devils' Tower in Wyoming.) Note in the accompanying video clip how the two diamonds attached to the color guard poles could spin independently of each other. The brass chords at the end of the selection were of stunning volume and gave us an indication of the magnificent sound to come from future Star corps. "The Throne Room" from "Star Wars" was a brief repose from the intensity of the earth-shattering volume the corps demonstrated just prior. "Finale" from "Star Wars" ended the show with the corps' trademark star formation, but minus the "squirrel cages" that started the season. These were huge contraptions that sat at the back of the field the entire show, into which guard members would climb for a grand finale of spinning around on the rims. (Think of what happens when a hubcap falls off a car that has just driven over a pothole, as it moves around its rim in a single location, before it finally falls and comes to rest.) These guard props never made it past the beginning of the season. In early July, a backhoe dug a large hole behind Star Hall and unceremoniously buried the devices, where they may stay until a future generation unearths them and wonders what kind of a bizarre sacrificial archeological dig they've mysteriously stumbled upon. This week only, you can save on 1986 World Championship Audio and Video Performance Downloads on the DCI Fan Network. Buy the 1986 Star of Indiana Video Performance Download. (Available this week only for $3.99. Regular price: $4.99.) Buy the Audio Performance Download bundle of all 12 Finalists from 1986. (Available this week only for $15.99. Regular price: $19.99.) Offer ends Monday, Jan. 16 at 8:30 a.m. ET.